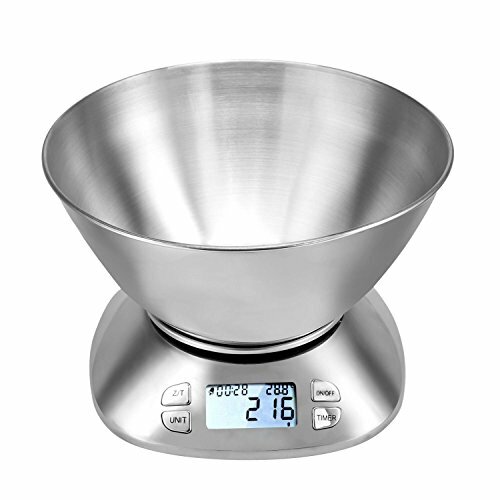 ❀Accuracy--- The error of this scale is 0.1oz/1g with a max capacity of 11lb. Besides, it has a precise tare function which allows instantly reset. ❀Multi-Measurement--- It supports both the metric and british system at the same time, and the unit includes kg-g, lb-oz. What's more, it also capable of measuring volume weight. ❀Convenient--- It equipped with a detachable bowl which has a large capacity of 2.15L to offer you am excellent using experience that you can measure liquid and solid. ❀LCD Screen--- It has a blue backlit display which is clear to know about the measurement and overload indication. ❀Auto Close--- The scales is capable of automatically switching off after 90S of inactivity, and it meets CE/ROHS certification, please rest assure to purchase.